No one else offers the "Exclusive" features found standard on the Sunflower 7200 Soil Conditioner. Wings that flex both up and 10 degrees below level. Adjustable wing sections that allow the Soil Conditioner to be "tailored" to the width of the hose machine. Overlapping gangs to condition soil completely across the entire machine eliminating any misses. And you won't find C-Flex™ mounted "Chevron" reels on the competition either, they just can't keep up. Three Year Warranty: All Sunflower Equipment features superior engineering and rugged construction that will withstand the test of time. Simply stated, it's the finest tillage equipment available. We're so confident, we place a three year limited warranty on every tillage tool we build. C-Flex™ hangers: Sunflower utilizes C-Flex™ hangers to mount the reel gangs to the frame, eliminating springs or pivot points to grease or wear out. C-Flex™ hangers provide a consistent down pressure on reels while furnishing cushion to the frames. Chevron Reel Design: Sunflower's exclusive "chevron reel design" pulls 30% easier, eliminates vibration and conditions the soil more uniformly. The chevron designed rods help create the structural strength needed to withstand the toughest soil conditions. Heavy-Duty Reel Design: Utilizing 1 1/2" solid gang shaft and large greaseable triple lip sealed trunnion bearings ensure a longer reel life and less chance of bending when encountering field obstacles. The large gang shaft resists flexing and stretching during use or while tightening. Large 17" Diameter Conditioning Reels: For superior "stay clean" ability, the 7200 has heavy-duty large 17" diameter conditioning reels with ten 7/8" chevron rods. The wider spaces between rods ensures less trash accumulation, while producing desirable firming and soil conditioning effects by constantly contacting the soil. Reels overlap for superior coverage. Hitch is Fully Adjustable: Gang width and length of the pull hitch is fully adjustable to allow the Soil Conditioner to be tailored exactly to the host machine. 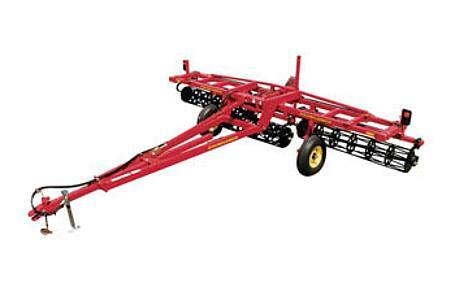 The hitch can be lengthened or shortened to accommodate attachments and the tillage tool turning radius. Width in most models can be adjusted up to 30 inches to match the cutting width of the host machine. UHMW Polymer Technology: The use of UHMW polymer technology in high wear and high maintenance areas eliminates metal to metal contact. This results in less wear to the Soil Conditioner, preventing parts replacement and time-consuming maintenance.